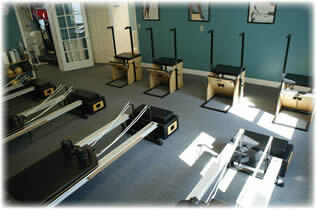 The Maine Pilates Studio to visit! Pilates is a neuromuscular strength training program that focuses on proper technique and body mechanics. Whether you are looking for pilates in Bath, Brunswick, Topsham, Freeport, Yarmouth or anywhere in between, let our knowledge power your body! We are a fully equipped pilates studio, featuring all STOTT equipment in a beautiful naturally lit space: 6 reformers, 5 stability chairs, cadillac, spine corrector, arc barrels, fitness circles and so much more. 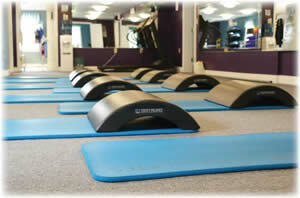 Whether you are looking for private sessions or classes, come find out why our clients say we're #1 in midcoast Maine! Our mat classes incorporate arc barrels, foam rollers, fitness circles, toning balls and/or stability balls to strengthen your body from the inside out. No need to bring a mat - we provide everything you need! STOTT PILATES® is a contemporary approach to the original exercise method pioneered by the late Joseph Pilates. Co-founders Moira and Lindsay G. Merrithew, along with a team of physical therapists, sports medicine and fitness professionals, have spent more than two decades refining the STOTT PILATES method of exercise and equipment. This resulted in the inclusion of modern principles of exercise science and spinal rehabilitation, making it one of the safest and effective methods available. This clear and detailed approach forms the basis for STOTT PILATES training and certification programs. It’s used by rehab and prenatal clients, athletes, celebrities and everyone in between. Other hours we are "unplugged"